Kefalonia yacht charters, Ithaca sailing holidays Ionian. The largest island of the Ionian Islands, Kefalonia - Κεφαλονιά - Kefallinia - Cephalonia - Kefallinia - Cefalonia is made of bare limestone mountains rising to 1618 m in Mount Ainos. The gorgeous rocky island of Ithaca is separated from Kefalonia by the 2 nm wide Ithaca channel and is almost cut into two by the long Gulf of Molos on its east side; the isthmus is only 600 m wide. Ithaca, together with the Echinades isles - forms a marvellous area for yacht charters. The Echinades islands were named after the sea urchin (Echinoidea) describing their sharp and prickly coastlines. 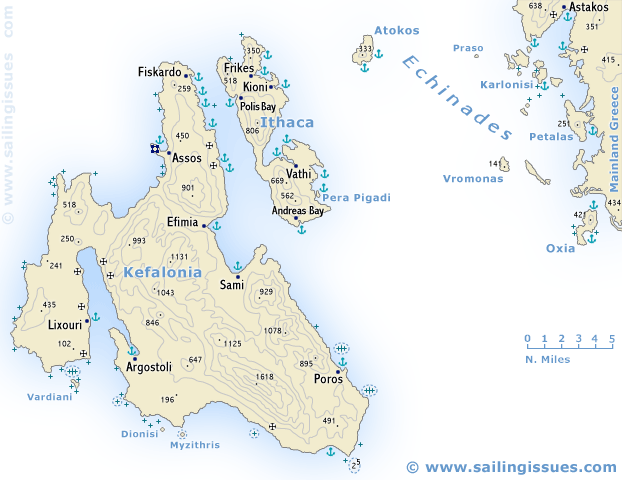 Atokos Island is uninhabited but provides two beautiful anchorages. The must-see harbours and anchorages include: Frikes, Kioni, Vathy, Polis Bay, Pera Pidagi, Atokos, Astakos, Oxia, Efimia, Poros, Fiskardo, Assos and Argostoli plus the series of bays south of Fiskardo. The earliest finds of pottery point to a first settlement towards the end of the 3rd millennium BCE. A number of Mycenaean sites have been identified, though their poverty is difficult to reconcile with the wealthy Homeric times. In the 6th and 5th century BCE the Islands were - like Corfu - under the influence of Corinth; then in 456 BCE Tolmides compelled it to submit to Athens. At that time there were four city states on Kefallinia - Kranioi, Pale, Pronnoi and Same - which Thucydides refers to as a tetrapolis. The cities were members of the Aeolian League, and Cephallenian vessels fought against the Romans, but eventually the island fell into the power of Rome. Thereafter the islands shared the destinies of the other Ionian Islands. The ports of Ithaca and Kefalonia aren't proper bases for yacht charters, the nearest main base to start your sailing holidays is Lefkas (Lefkas port, Preveza or Nidri). 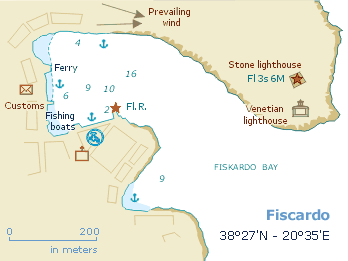 The entrance to Fiscardo bay is difficult to locate, but a few modern buildings north of Fiscardo are conspicuous. The Large stone lighthouse as well as the smaller Venetian lighthouse are clearly visible. Excellent shelter in all conditions, although the anchorage just below Fiscardo town has a bad reputation (bad holding and less protected). 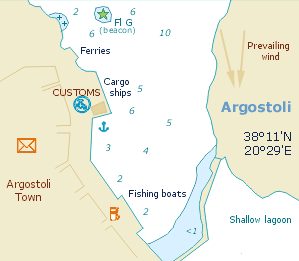 Argostoli port is located in the deep Kolpos Argostoliou. This bay is frequented by the ferry between Lixouri and Argostoli (caution). There is a reef running from Cape Pelagia and from Cape St Nikolaos. When you have reached the port of Argostoli you can berth stern-to or bows-to near the ferry quay. If you prefer to anchor there is a cove on the east side of the entrance of the inlet, poor shelter. 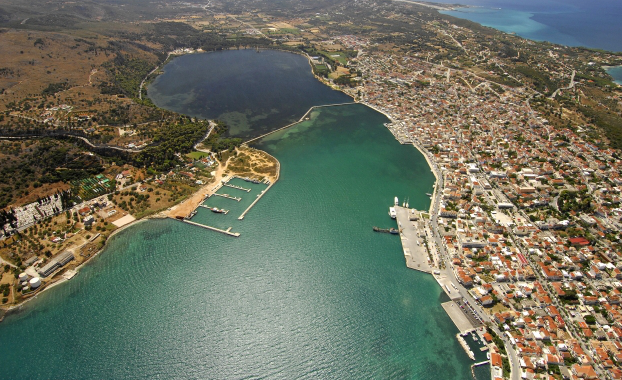 ↑ Aerial photo of Argostoli port, looking southeast.